The Minister of Industry, Commerce, Agriculture and Fisheries, the Hon. Audley Shaw, recently called for increased integration of Airbnb operations into community tourism offerings. Prime Minister, the Most Hon. Andrew Holness, stated that there is scope for greater expansion of Airbnb services in Jamaica, from which hosts in Kingston and St. Andrew earned US$2.4 million in 2017. According to data from Airbnb, there are now 3,100 hosts in Jamaica, up from 2,300 in December 2016. Listings also saw an increase from 4,000 in 2016 to 5,900 in 2017. Visitor usage saw the most significant increase from 32,000 in 2016 to 59,500 in the last 12 months. This expansion in the short term rental market in Jamaica and its integration into community tourism can create contentious issues with respect to existing laws and contracts governing tourism, real estate and housing and may require amendments to these laws. The “laws” which are likely to be most affected are the by-laws. By-laws are the laws which govern management, administration, use and enjoyment of the strata lots and the common property in registered strata plans. Most apartment complexes, townhouses and gated communities are governed by by-laws. By-laws are instruments made under an Act (in Jamaica, the Registration (Strata Titles) Act), and should not contradict, be repugnant to or inconsistent with the Act under which it is made. As recently as December 2017, the Privy Council was asked to consider the relationship between short term housing on the one hand and existing by-laws and the statutory framework of the country on the other hand. In O’Connor (Senior) & Others v The Proprietors, Strata Plan No 51  UKPC 45 (“O’Connor”), the Privy Council upheld the validity of a strata by-law which prohibited leases of residential premises for a duration of less than one month. O’Connor was an appeal to the Privy Council from a decision of the Court of Appeal of the Turks and Caicos Islands. The case concerned “The Pinnacle” which is a condominium development of 34 residential apartments and associated facilities at Providenciales, Turks and Caicos Islands. The O’Connors were owners of an apartment in the Pinnacle and began renting to holidaymakers for short stays of less than one month. The strata corporation sought an order restraining such use as being contrary to the by-laws of the Pinnacle. The trial judge dismissed the strata corporation’s claim, but this decision was reversed by the Court of Appeal. The O’Connors appealed to the Privy Council. The main issues in the appeal turned on the interpretation of the by-laws of the Pinnacle, and their validity having regard to section 20(4) of the Turks and Caicos Ordinance. For this purpose “Residential Strata Lot” is defined as “a Strata Lot which is intended for use as a residence”. This section is identical to section 9(4) of Jamaica’s Registration (Strata Titles) Act. The court noted the difficulty in distinguishing between short term and long term rentals but placed emphasis on the character of the use. The Privy Council held that the character of the use is clearly affected by the length of occupation. Short-term use by holiday-makers is different in kind from longer-term residential use, even if it may be difficult to draw a clear dividing line. The Privy Council held that the by-law in question could restrict short-term leases of less than one month because the by-law referred to a “Residential Strata Lot”. In the Privy Council’s view, the limitation to one month could be seen as designed to provide some definition of what is meant by “use as a residence” for this purpose. By requiring leases to last for at least a month the by-law ensured the required degree of stability necessary for a unit to be properly characterised as a residence. Accordingly, the by-law did not fall foul of section 20(4) because it was a legitimate restriction on use that ensured that the residential character of the complex was protected. The O’Connor’s appeal was dismissed. Even though this decision is not binding on Jamaican courts, it will be considered highly persuasive. The decision in the O’Connor case may result in owners and strata corporations successfully restricting short-term holiday renting through platforms such as Airbnb and Stayz by including a by-law which imposes a minimum one month term. Conversely, owners and strata corporations may seek to relax by-laws which currently contain similar restricting provisions, in order to allow owners to tap into the expanding short term rental market. It is imperative that when purchasing a strata unit, persons ascertain whether the by- laws permit short term rentals. It is also advisable to have an attorney-at-law review the existing by-laws of your strata corporation in its entirety and advise whether amendments are required to properly provide for these short term rentals. An attorney-at-law may also advise on remedies available, such as injunctive relief, in circumstances where there is a breach of a by-law which restricts short term rentals. 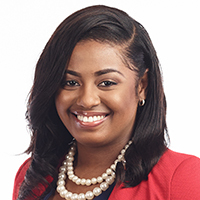 Amanda Montague is an Associate Attorney-at-Law at Myers, Fletcher and Gordon and is a member of the firm’s Litigation Department. Amanda may be contacted via amanda.montague@mfg.com.jm or www.myersfletcher.com. This article is for general information purposes only and does not constitute legal advice.